Incremental Tungsten Cylinders contain five 1/2 ounce cylinders, one 1/4 ounce cylinders, and two 1/8 ounce cylinders. Using the incremental cylinders, you can acheive any weight between 0 and 3 ounces in 1/8 ounce increments. 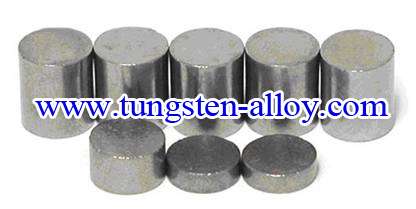 For similar reasons tungsten is a superior product for weighting cars. Tungsten is 3.2 times the weight of the no-lead weighting material often used on cars, thus it enables tremendous flexibility in the design of the car. Coincidentally, tungsten has been used by NASCAR for the metal roll cage and as frame ballast to lower the center of gravity of the race car. Tungsten Cylinders can be easily used for car weighting by drilling one or more 25/64" or larger diameter holes into the block and then inserting the desired number of cylinders. The hole can then be plugged with a piece of 3/8 inch dowel rod. Since the Tungsten Cylinders are very hard, do not plan to drill out any extra weight. Instead, use an alternate method to make fine adjustments such as adding/removing tungsten beads. Tungsten Cylinders are specifically required for the following cars. 4 ounce nominal weight - actual weight ranges from 3.9 to 4.0 ounces. If you have any interest in tungsten cylinders, please feel free to email us: sales@chinatungsten.com sales@xiamentungsten.com or call us by: 0086 592 512 9696, 0086 592 512 9595. We are at your service.